To change from 'like' to 'love,' what strategies must Ozawa use on Hozuki? Hozuki Heiji is the troublemaker. He gets into fights and is very cold to everyone. Ozawa Kii witnesses a fight between a classmate and Kazuki but he unexpectedly says he wants to become friends? And what's this about 'like' and 'love'...?! This story is waaaaaaaay too cliche, this type of storyline is already being overused over and over for the past years; a ‘bad guy’ to the eyes of many meet the ‘shy girl’, they become friends and soon become lovers. Struggles includes the ‘past girl/boy of their life’ that seems never gets old. Don’t get me wrong though, I love and appreciate any type of story when it comes to shoujo, may it be cliche or not. It’s just, in majority, the story of these ‘cliche’ is poorly made; making it without giving a proper thought of deliverance. I have such a high hopes for every manga that I’ve read/I’m reading, giving them the chance they deserve, but Koisuru Harinezumi loses it’s kind of potential to grow as an exceptional shoujo manga. “Everything can start off as a cliche, but ending up as something more that people except them to.”, and this line, is the perfect way to describe what this manga should be instead. I liked that it start off something so fast but there are some unnecessary scenes that should go off slow-paced, taking it into much more depth, creating and focusing on character development. I love chapter 22 and 23; where the parents of both main characters we’re introduced though they are short-lived, it has a nice atmosphere to it. My complaint is they can broaden both chapter 22 and 23 more, adding two or three chapters more to have much definite character development and deepening of the story. To add more realistic drama feeling overall, even so, it cannot be helped anymore sine it’s been done and published. If only this manga captures the right blend and timing, it would have a different aura overall. Does Ozawa, Kii got any character development? No. Does Heiji Hazuki got any character development? No. Is that bad? A MAJOR YES. I’m attached to Hazuki to the point I want him to myself, I have come to love the drawing of the characters, especially on how Hazuki was drawn. It feels like I’m drowning whenever I look into Hazuki’s eyes, siiiiggghhhh. It still feels odd to me on how the extra/supporting characters began to end up that way when I can’t see any type of basic foundation for growth development. Hazuki’s old friends are okay (somehow) but on the side of Kii, there’s no way I can accept that. It feel so dull and bland, no such strong basis. Same goes for the class too. It looks like Kii have no real friends at all even how much people are surrounding her. It feels lonely. To be honest, I was really hesitant to read this manga. The art was not my type so seeing the volume 1 cover, I was reluctant if I should really give it a go or not. What I don’t really like in particular is that 80% of the time, most of the characters look the same and the way they drawn, they look 10 years younger with a grown-up bodies. I’m very much drawn to a detailed drawing so when I read this manga, I haven’t seen anything a ‘masterpiece’ regarding the background and everything extra and so, I was disappointed. Background and such related is important to any type of manga, it gives off a spark, a spice overall feeling to the manga. I’d give this a four out of five because though art is an important factor for a comic for it portays the story, we cannot help but to adjust and understand that everyone has their own style of art just like Nao Hinachi, the mangaka of Koisuru Harinezumi. I really enjoyed reading this manga all throughout. There are quite some time that I get annoyed or irritated at the pacing and the attitude of some characters yet I still enjoyed myself reading it to the end. It’s really such a waste when at the chapter 22 to the last chapter (24) feels sooooo great; the emotions are there, the settings is acceptable, everything is going well but the whole climax aura was short-lived, cut short, died and thrown away for the ending was just that. Actually this manga is really good. It has a fluffy-fluffy, easy-going atmosphere surronding it the entire series. No matter how low or high my ratings are, it doesn’t matter for people have their own unique set of preferences and ideals. If you, yes you reader, has taken aback for considering this manga then I advice to you to reconsider it again. 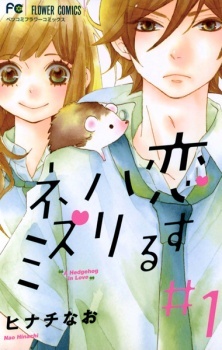 For new and veteran readers in the world of shoujo manga, Koisuru Harinezumi still should be one of the titles that up for the recommendation list. Being a shoujo you know what to expect. It's pretty much like any other shoujo out there. A girl meets a problematic guy who ends up being not that problematic and they fall in love. I must say though that despite having the same cliches as any other story of this kind, the author solves the misunderstandings quickly and through the communication of the main characters, avoiding making pointless drama, which I must say it was a nice touch! The art is really cute. Everyone is adorable! The characters are not particularly remarkable. They are stereotypes, the boy being the 'silent type' and the girl being the naive one. The characters are charming and the story is easy to read. So if you want a romantic story with no drama I think this is a good option. The characters are cute and the story is nice and funny. ice if you don't want to read a very long story. It could just be me but I can't seem to find any english scanlated chapters past 20. If anyone has a link for it, it'd make me very happy if you could share it with me. As of now, my review will only be on the story up till chapter 20. The plot starts off very cliche, and in many cases including this, it's not entirely bad. There are things that are easily expected with the plot when it comes to shoujo mangas so the plot for this manga isn't relatively unique. In some parts, the pacing is questionable. Small arbitrary plot devices were used a few times, but they're not easily recognizable and won't bother you much unless if you really analyze the manga as a whole. Regardless, this manga is still enjoyable. What you'll get through reading the manga is more on the journey towards a better and close relationship between the main couple, and not about the goose-chase. It's interesting to see how the characters deal with each other's antics, some in the most surprising yet nice ways. Being a sucker for anything cute-sy, I personally love the art in this manga. It's simple yet adorable, and shows just enough details - befitting for the typical shoujo-manga look. Those that are used to the very precised and realistic look may find it a little bit difficult to accommodate with the change. The artist doesn't focus very much on the drawing of the backgrounds but it never really bothered me much since I mostly focus on the characters, especially the main male lead. ...I had a hard time trying to read past panels of his close-up face. Either way, I believe art is subjective so do take this part of the review with the utmost grain of salt. While the side characters weren't given much focus to begin with, both main leads were shown to be charming in their own way. They have their own strengths and flaws, and with those flaws you'll see how the two leads came to fit with each other. Character developments weren't anything drastic, but it's still enjoyable to read through their antics. I read a lot of shoujo mangas so this manga itself isn't very memorable to the point of 'i'll remember it for life' since it followed closely to the cliche plots of shoujo mangas, but what I find memorable is the happy feeling I get when I read through it. I may just be too sensitive, but the moments the two leads share make me incredulously happy. Sure, this manga has its flaws but I still loved it nonetheless and will definitely re-read it in the future for the sake of reliving the fluffs again. It's an easy-going manga - heartwarming and filled with squeal-material scenes. If you're looking for a shoujo manga that doesn't go very deep with the drama, or you're new to shoujo mangas, then I would totally recommend reading this.